There are input signals ... and there are output signals. In between your signal gets altered (transposed). The bottom keyboard represents the input section. Here is where your actual finger actions is shown. With AutoTonic you play on white keys only, the black keys become function toggles instead – to switch scales in realtime, while playing. The upper keyboard represents the output section, here gets displayed what the output mapping results in and what notes are currently triggered. Convert simple input notes into highly complex music, with the push of a button. 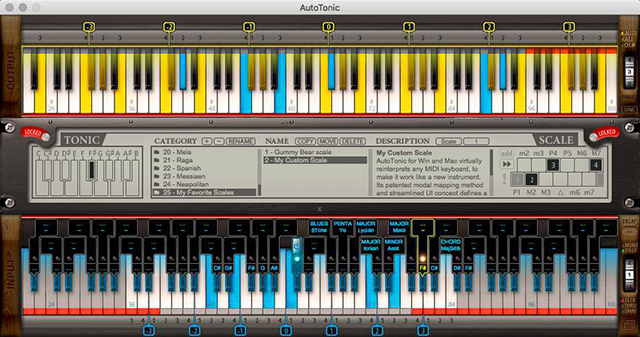 With AutoTonic there is no need to spend hundreds (respectively some charge thousands) of dollars on an exotic musical device -- now you can simply 're-model' your existing MIDI keyboard so it will feel like a complete new controller. There aren't many things you can do to improve your creativity, but one of them for sure is AutoTonic. So if you're looking for a MIDI chords & scales transposer, this is the one! For those new to AutoTonic, in this video I will explain what AutoTonic is and how it works. Need help with the setup? You can always reach me by or contact me through the livechat window, when available (my timezone is GMT+1). AutoTonic's User Manual provides all pertinent information for the operation and installation.